Known for its top-notch restaurants, history and creative vibes, Easton offers a unique perspective on small business and retail shops. With a vast selection of delicious restaurant options, it can be difficult to choose just one to visit. The Taste of Easton Tour Company has concocted the ultimate taste of Easton, which ventures from one exquisite restaurant to the next offering bestselling menu items from featured eateries. Stay tuned for the Taste of Easton launch party hosted by the Easton Chamber of Commerce, scheduled for this spring. Easton’s vibrant arts scene allows it to shine in a unique way. 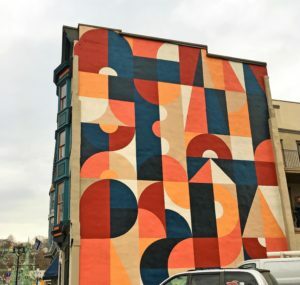 Art galleries and mural projects funded partially by grass-roots efforts as well as with support from the Chamber’s Main Street Foundation grant program decorate the city. Shops and restaurants exhibit local art, and if you’re up for creating your own you have options there, too. Local business Bottle and Bottega will surely satisfy your inner artist. You can get creative at Taylor Made Polish where you can create your own custom bottle of eight or 10 chemically-safe nail polish options. A true gem, the beautiful and historic State Theatre Centre for the Performing Arts where visitors and locals can take in a performance or plan an event of your own. The Chamber’s Women’s Business Council of the GLVCC just hosted its annual Athena Awards at the State Theatre with the reception in the timeless Acopian Ball Room. Easton’s unique footprint includes farms, breweries, museums, the longest consecutively run open-air market and more. Speaking of well known, The Crayola Experience attracts thousands of visitors every year, which will surely complement the proposed Da Vinci Science Center and Aquarium. Growing everyday, Easton will no doubt flourish in the new year.